“Give the Best Quality ,the Best Service and the Best Product to Each and Every Customer”. Considering a new fence for your property? When you choose Milestone Fencing as your Williamsburg , fencing contractors, you're choosing a reputation for honest service and high-quality work. Our commitment to customer satisfaction has earned the trust of the community here in Williamsburg,VA and we're pleased to put our skills to use on your next project. A fence doesn't just protect your property. It makes a statement, and can add value and style to your real estate investment. That's why we'll work with you to find the option that's just right for your needs, whether you're looking for a traditional wooden design or something more modern. Of course, if you have an idea in mind already, we can suggest quality materials and provide labor to make your vision a reality. Our services are provided for the Richmond, Williamsburg, and the tidewater areas . Fortunately, sometimes there is a happy marriage between form and function. But such is not always the case. For instance, chain-link fencing and other metal products often make for superior security fences. Therefore, if the intended function of your fencing is security, you may have to choose between form and function: the style of your house may cry out for a wood fence, but security concerns may convince you to go with the metal. Considering cost as well as effectiveness, chain-link fencing provides homeowners with the best option for security fences. When using chain-link fencing to provide security, strive for a height of 6’ or greater and a thickness of at least 9-gauge. Avoid solid barriers when erecting security fences. For, while a visual barrier is desirable when erecting privacy walls, it is counterproductive for security, affording trespassers a place to hide. Vinyl fences offer low maintenance -- never paint or stain again. 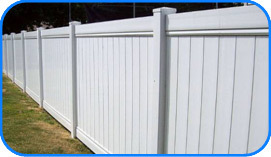 At a distance, some high-quality vinyl fences do resemble the traditional wood fence designs for which they are substitutes. Vinyl fences don't splinter, making them a child-friendly alternative. Just as PVC vinyl fences attempt to mimic the look of wood fencing, aluminum fences are often thought of as a substitute for wrought-iron fencing. Wrought-iron is the tougher material of the two (it won't dent as easily), but it will rust without significant maintenance on your part. Aluminum fences are less prone to rust. If a thick gauge is selected, they may excel even vinyl fencing in durability, since this metal does not become brittle in cold weather. When you shop for an aluminum fence, check to see if it is painted or powder-coated. Powder-coating is considered a superior way to weatherize the product. Powder-coating is available in a number of colors. Aluminum fences are a popular choice as a protective barrier around swimming pools. Vinyl is more popular in most areas for privacy fencing. Nonetheless, where privacy is not paramount, many people may prefer the satisfying feel of metal afforded by aluminum fences.